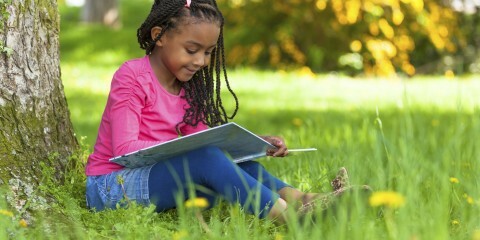 At age four, Caitlynn spends most of the day imagining what she will be when she grows up. 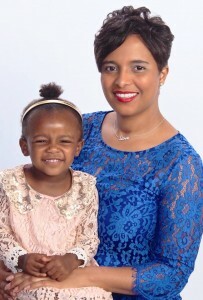 So far, it’s down to a baker, a teacher and a vet, thanks to Doc McStuffins. Playing pretend is her favorite past time. This week, we went out west and added a cowgirl to her list of future occupations. We staged a stick horse race in the backyard. 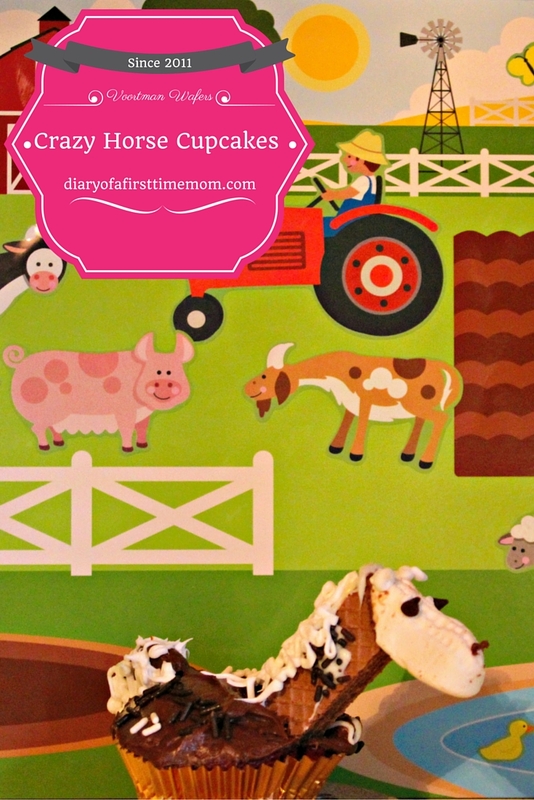 And after we worked up an appetite, we baked up a farm themed cupcake in the kitchen. Our mommy and me activity was Inspired by Voortman Wafer Cookies. 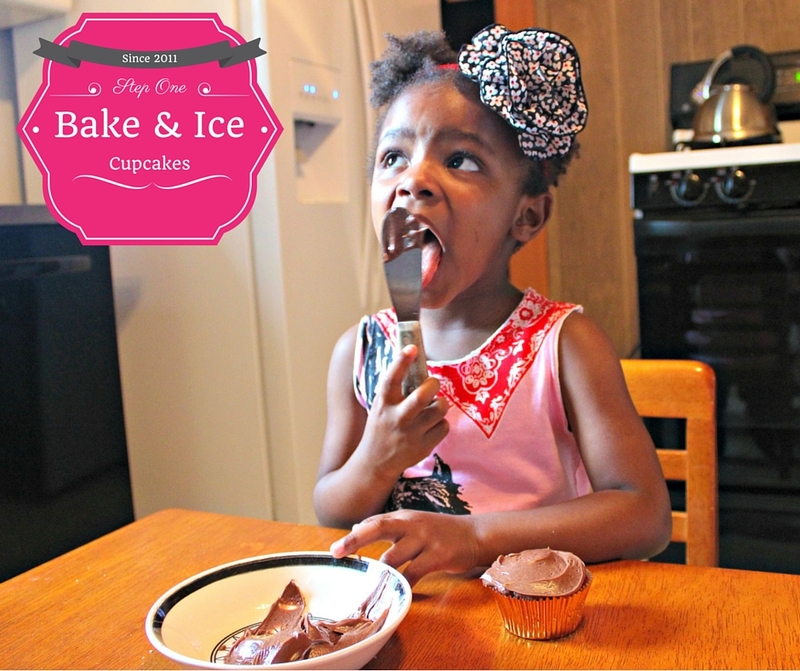 Bake and ice your cupcakes. We whipped up Red Velvet cake mix and chocolate icing, but you can use any of your favorite flavors. Of course, let your little one lick the spoon! To make the crazy horse’s neck, you’ll need crazy glue. Place the chocolate and vanilla melting wafers in Ziploc bags. You’ll use this now and in steps to come. Cut the top of the Voortman Chocolate Wafer diagonally. We also bought Vanilla and Strawberry for a variety in our “herd.” You’re sure to find something that satisfies your appetite. Voortman also comes in Peanut Butter, Lemon, Coconut Crème, and Cookies’n Creme, as well as a selection of no sugar added options. After you cut your wafer, cut your white circus peanut diagonally. Squeeze your “glue” on the ends and attach the circus peanut and the wafer. You can use either color–just make sure you separate the white and brown bags. 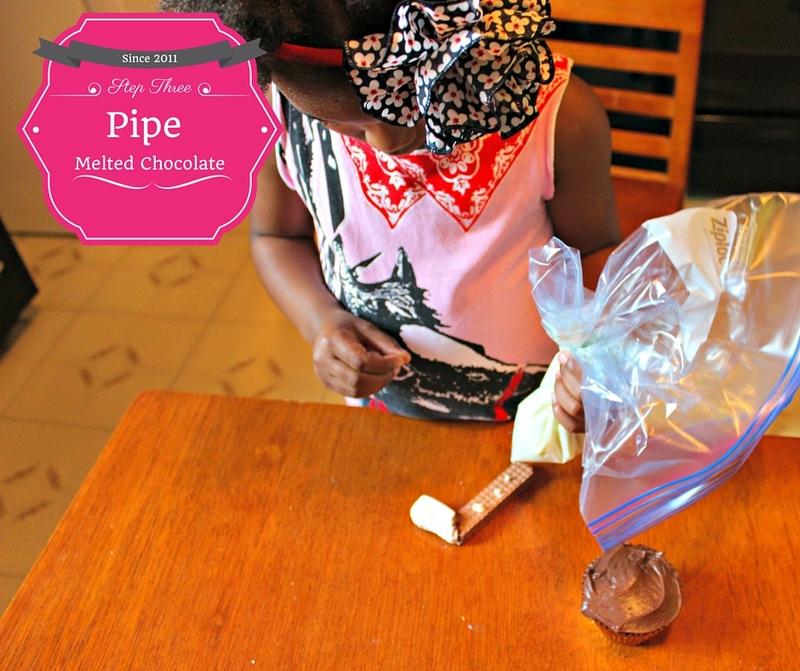 Using the white “glue,” pipe dots onto the melted chocolate onto your Voortman Wafer. 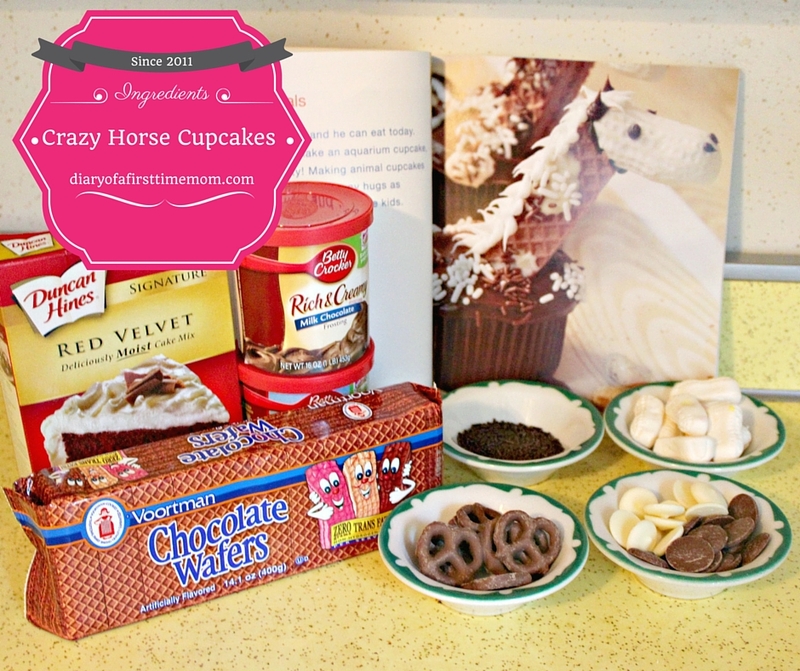 Cut your pretzel in half and insert your horse’s tail into the cupcake. 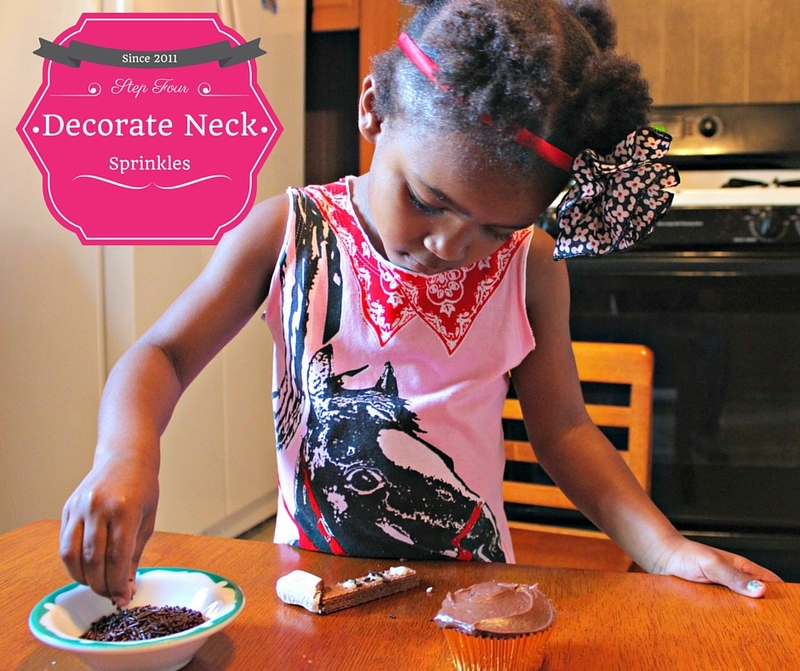 Using a knife, make a small slit into the front of the cupcake and insert your horse’s head. Pipe dots of melted chocolate–either color–for your horse’s eyes and nose. Pipe stripes of melted chocolate back and forth on the mane and tail. 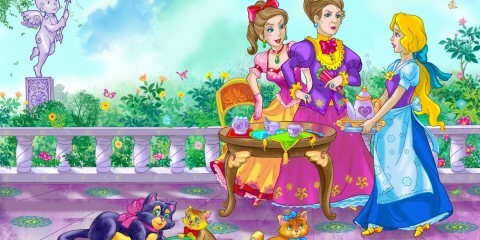 You can even make hair by piping of few strokes between the ears and forehead. 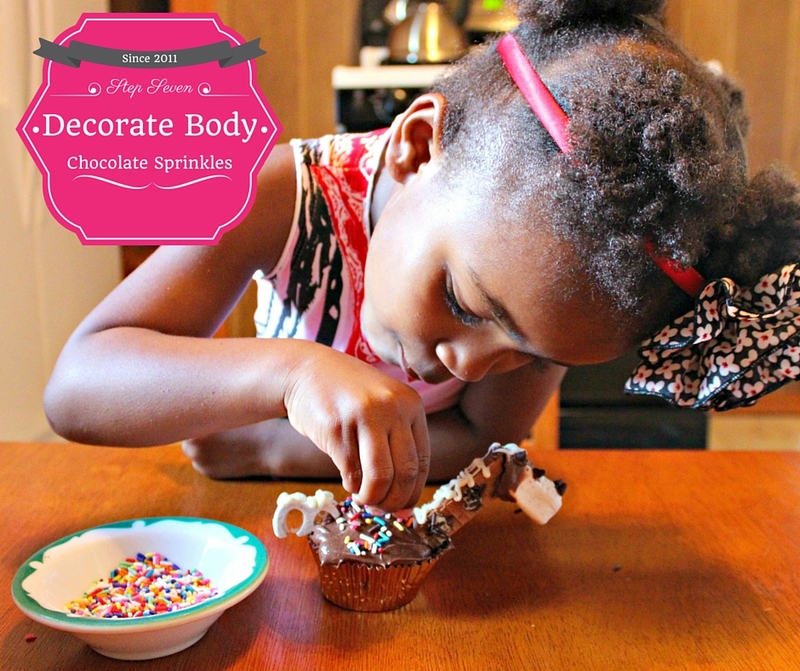 Decorate the body of the horse with chocolate sprinkles. Make your horse feel at home! We displayed our horse with a reusable sticker page as the backdrop. 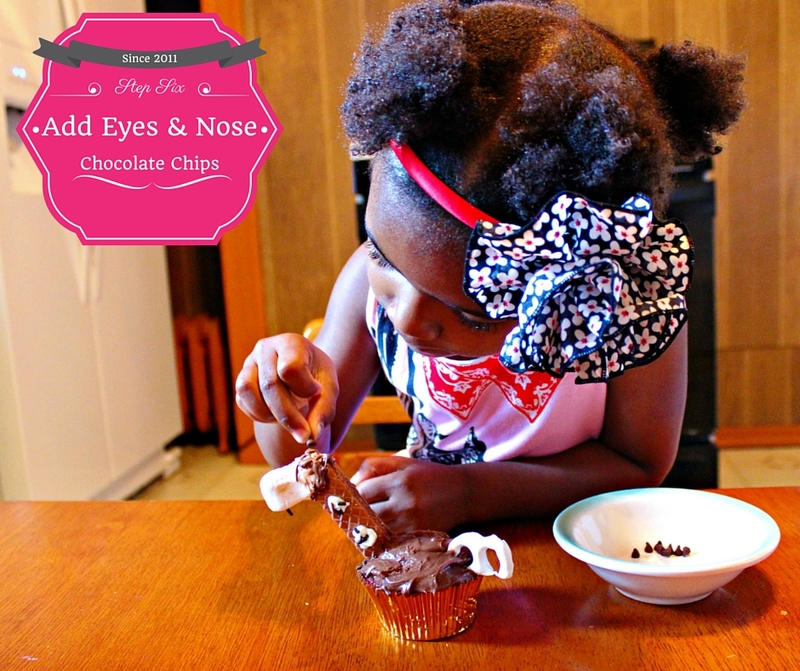 Next eating sweets like cupcakes, Caitlynn’s favorite thing to do is sticker activities. 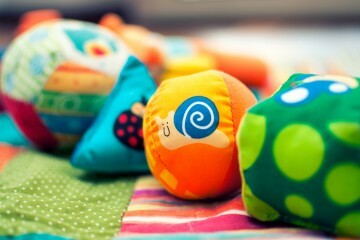 Get creative! Use potato sticks for hay or jelly beans for snacks. 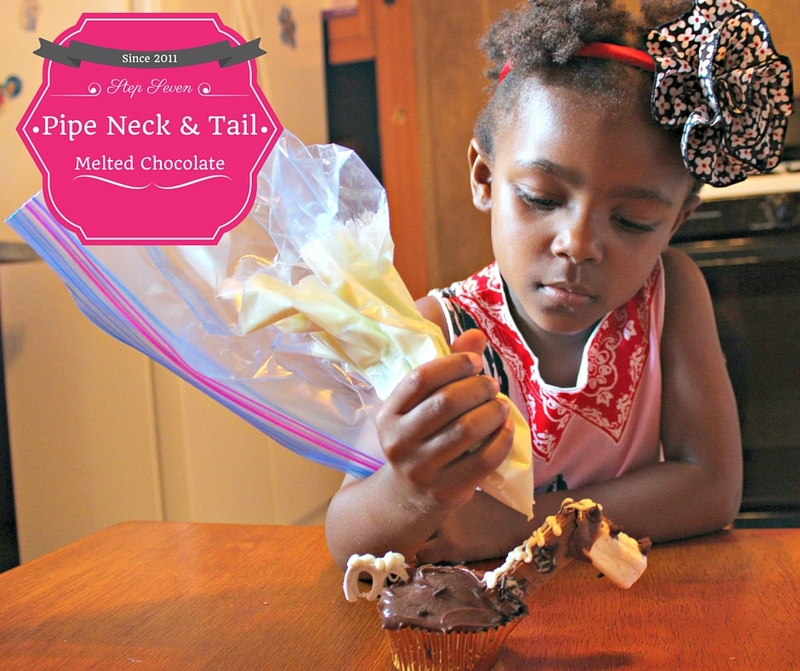 This is one food your kid can actually play with before eating! 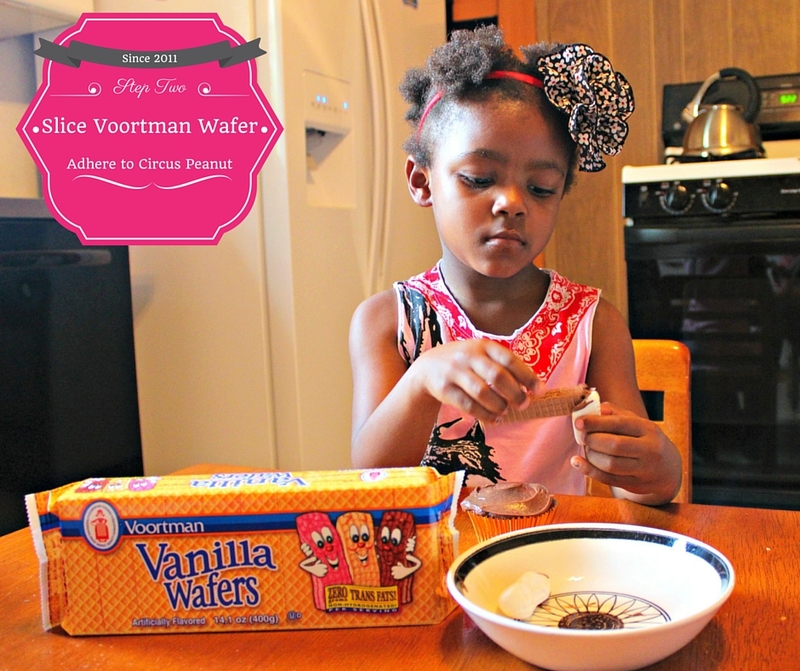 Hey DFTM Fam–What mommy and me recipes can you whip up using Voortman Wafers? 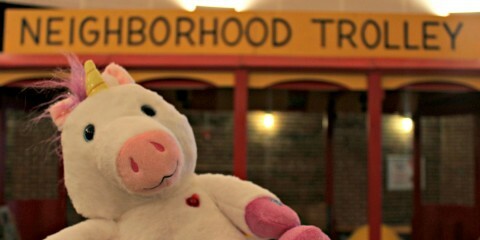 Will you make a farm animal like Caitlynn, a princess castle or a cartoon creation? Your cookie creation could land your family an ever bigger treat–$2,500! 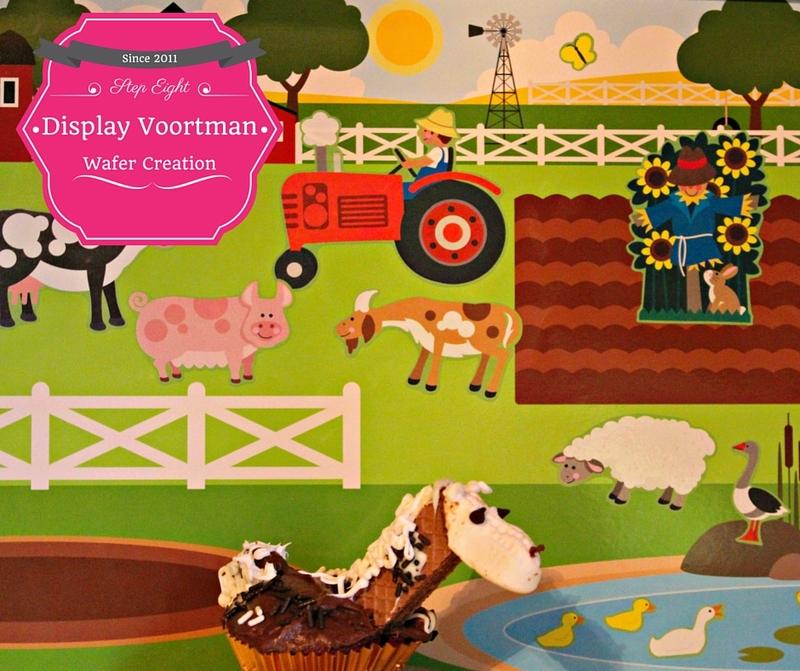 Enter the Inspired by Voorman Wafer Contest by clicking here. The contest runs from now until June 13th. 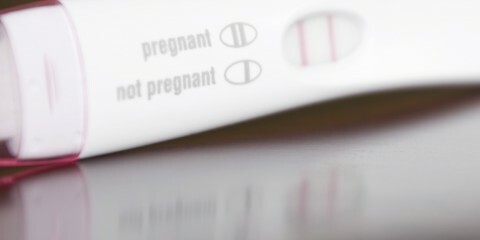 Check out the tips and guidelines as well as the rules. Wafers must be a primary ingredient or inspiration for the creation.